I can hardly wait for this Saturday when the "Mythic Creatures: Dragons, Unicorns & Mermaids" exhibition opens at the Fernbank Museum of Natural History. It's the perfect complement to the "Monsters, Demons & Winged-Beasts: Composite Creatures in the Ancient World" exhibition at the Michael C. Carlos Museum at Emory. 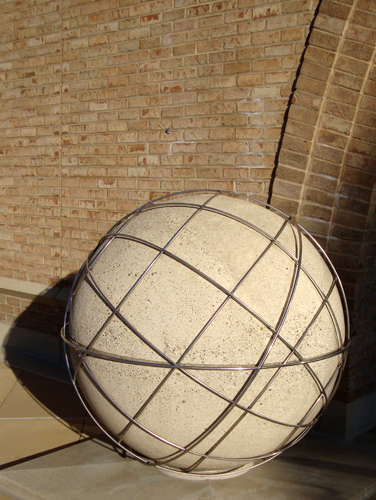 So, why the photo of a round rock encased in a steel cage? That, my friends, is one of a pair of sculptures flanking the entrance of the Fernbank Museum of Natural History. It is titled, "Celestial Sphere." With that established, we have an excellent foray to the Mythic Creatures exhibit because dragons, unicorns, and mermaids can be found, or are at least referenced, in the actual Celestial Sphere. First, the Celestial Sphere is an imaginary sphere with the Earth at its center. This sphere assists astronomers in tracking the stars in a universe where stars and Earth are always moving. Now, to tie the Celestial Sphere photo to the upcoming Dragons, Unicorns & Mermaids exhibition, let's explore the constellations of the night sky. A dragon, the Dracos Constellation, can be seen all night from the northern hemisphere and is wrapped around the Little Dipper. The Monoceros Constellation forms the shape of a unicorn, which is a mythical creature that can be traced back to 2,700 B.C. Monoceros is near the constellation Orion and is associated with an annual meteor shower (the Monocerids) that takes place on or around December 10. There is no mermaid constellation, but the Delphinus Constellation is named for a dolphin that helped Poseidon find the mermaid called Amphitrite. Delphinus is visible in late summer and is near Pegasus, another mythical creature. I didn't know it was at Fernbank too. Thanks for the tip.